I woke this morning to the sound of birdsong and the gentle lapping of the River Slaney against the banks of the river estuary below my room at the Ferrycarrig Hotel. The sun is still late in rising these mornings, and so I stood and watched in awe at the majestic sight as it rose above the low hills on the other side of the river, casting streams of light on the Slaney as the tide came in and began to cover the mud flats. The Ferrycarrig Hotel is just 3 km from Wexford Town, and before dinner last night two of walked around the streets of the old town. in the dark, criss-crossing through the narrow streets and the laneways between Main Street, Peter Street, High Street, Rowe Street, Cornmarket and the Bull Ring, soaking in the pleasures of being back in a town that I feel so at home in. There was time to call in to the Library to meet Celestine Murphy, who has edited the Journal of the Wexford Historical Society, and even time for a quick haircut in the Bull Ring. Later, we were joined at dinner in Ferrycarrig by two former colleagues from my days at the Wexford People. Hilary Murphy was then the Assistant Editor and Nicky Furlong, who then wrote the pseudonymous ‘Pat O’Leary’ column. We have all contributed, in our own ways, to telling the history of Wexford, and we recalled how Hilary and Nicky were among a group of Wexford historians who travelled to Dublin for my ordination in Christ Church Cathedral. Earlier in the evening, I had spotted a T-short that claimed that Wexford was established in AD 900. 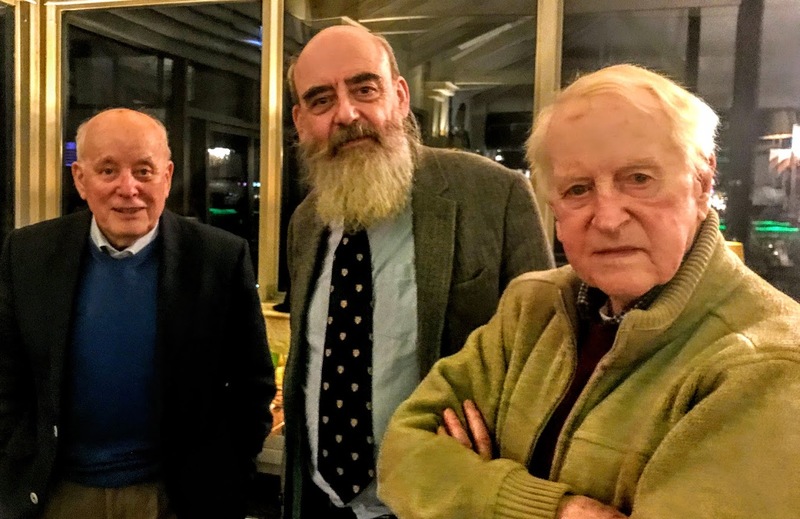 We all agreed the Viking town was perhaps a half century older if not more, and the discussion of Wexford history and Wexford journalism continued until late in the evening. This morning, the colours on the Slaney and in the skies slowly changed from greys and dull blues to contrasts of bright orange and silver sparkle and then to bright blues and reflections of the landscape in the water. Time moves on – in history, in life and on river – and each passing phase brings new opportunities and new blessings.